Last month, a lively contender emerged with an unanticipated and unprecedented confidence in his ability to go arm to arm with Venezuela’s long time president, Hugo Chavez. 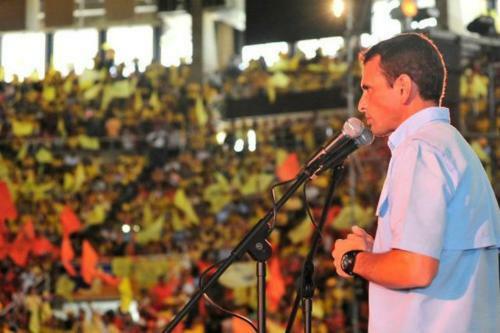 Henrique Capriles Radonski, the governor of the Miranda state seeks to defeat Chavez in the upcoming October presidential election. The recent commotion and continuous media coverage surrounding the upcoming Presidential election has incited interest among the more politically conscious Venezuelan people, who have grown accustomed to Chavez’s seemingly perpetual reign and eternal blusters. Capriles’ oppositional primary victory in February has given him riveting momentum in taking on the daunting task of superseding Hugo Chavez’s 13-year rule. The recent oppositional presidential primary attracted nearly 3 million voters, a landmark in terms of Venezuelan voter turnout. Capriles captured around 2/3 of all votes in the primary election within his party, routing Governor Pablo Perez of the Zulia state by an imposing margin. The youthful and enthusiastic Capriles has been more than willing to appear in front of a media hungry for an anti-Chavez spin. Capriles has been packaged as a youthful and worthy alternative to Hugo Chavez, who has made the public slowly aware of the true nature of his fragile physical state. Though Chavez has augmented his public appearances following his short-lived convalescence, there still exists a lingering uncertainty regarding the stability of his health. Apparently, Chavez’s battle with cancer is far from over. The 57-year-old leader dispelled all speculations that his cancer was in remission as he made yet another surreptitious voyage to Cuba to undergo radiation therapy earlier this month. Nevertheless, Chavez loyalists remain confident in their long-time leader’s ability to run the country effectively. At this point in time, Chavez is more susceptible than ever and more attention is being directed to his obstinate and tenaciously-held position regarding prominent economic problems that have plagued the country dating back to the beginning of his presidential tenure in 1999. Middle and upper class Venezuelans have repeatedly expressed their disillusionment regarding Chavez’s lack of focus when it comes to formulating a long-term economic plan. Instead, Chavez caters to the lower class Venezuelans, reinforcing his populist agenda through increased spending on social welfare programs as well as fundamental communal services to impoverished citizens. Chavez continues to mobilize increased support from the poor who hold him in the highest regard, despite the fact that his promises to curb income inequality have been largely fruitless. On the other hand, Capriles has emphasized his desire to preserve many of the social programs aimed at assisting the less fortunate citizens of Venezuela, while also implementing fiscal policies that will allow both the public and private sectors to flourish. Capriles has evaded many of Chavez’s attempts to vilify him and he appears unscathed by Chavez’s chronic “a la bourgeois” comments. Capriles confidently recited his mantra, “People know who I am,” in response to Chavez’s disparaging comments, where he referred to Capriles as a “low-life pig” only concerned with catering to the elite citizens. The intrepid Hugo Chavez remains vigilant and he is perhaps more determined than ever to subvert any challengers attempt to replace him as president. Aside from the fact that Venezuela could have a new leader to represent it in the international political arena, this election will also call attention to the importance of preserving presidential succession. The upcoming election will show whether or not Venezuela is capable of permitting a smooth transition of power, considering the fact that Hugo Chavez has been in power for over a decade. Chavez has faced biting criticism during his reign, for whittling away at Venezuela’s democratic foundation in his attempt to establish himself as the country’s absolute leader. Preserving the notion of presidential succession is essential in regards to preventing a leader from attaining absolute power. Additionally, the people of Venezuela will have more confidence in their system because they would know what to expect in a time of chaos should their leader leave office for any reason. Presidential succession is an indispensable aspect of democratic regimes, where accounting for every citizen’s vote is a defining characteristic. Typically, the incumbent has a greater chance of being re-elected so it will be interesting to see results of the widely-anticipated October presidential election. Capriles is the most formidable opponent Chavez has had to face since he began his tenure in 1999. An individual leader can impose policies as well as influence the greater political culture, so it is imperative that Venezuela’s electorate prepare to choose their next leader judiciously. Latin America’s Process of Economic and Social Stabilization: A Stagnant Experiment or a Force to be Reckoned With?